Star Warz just celebrated its 15th anniversary. 15 years of leading Drum ‘n’ Bass artists, 15 years with numerous label-nights, 15 years of outstanding breaks & basslines, 15 years of setting the Vooruit on fire on each & every occasion. The first international artist Star Warz ever invited was the mighty Ed Rush and now he’s back. 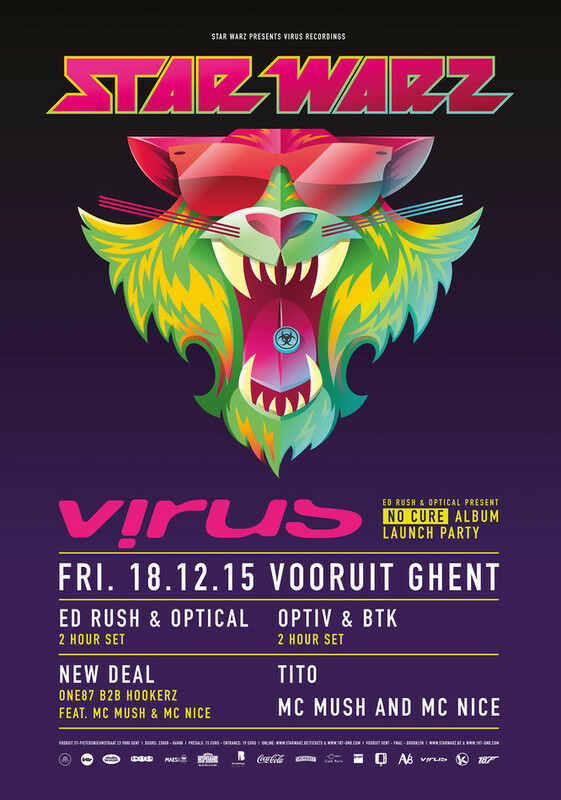 Not only with an exclusive showcase of Virus Recordings, but also to present his latest album with Optical ‘No Cure’. Virus Recordings is without a doubt one of the world's best loved Drum ‘n’ Bass record labels. It has released genre defining music since 1998 and is the label that started neuro-funk: the baddest, darkest music that pushed the boundaries of Drum ‘n’ Bass to places where other labels were and are too scared to go. Founded by Ed Rush & Optical for their joint productions, it became the home for several well received 12” and then the mythical album ‘Wormhole’ appeared. Dropping that immense debut album upon an unsuspecting scene, Ed Rush & Optical literally created an entirely new set of rules for succeeding in Drum ‘n’ Bass: take a set of tracks considered too edgy for the major players of the time, add your own label and a pinch of self determination and you end up with what is still widely regarded as the best Drum ‘n’ Bass LP of all time! Ed Rush & Optical have since moved through three more critically acclaimed albums, ‘The Creeps’, ‘Original Doctor Shade’ and the incredible semi-live project ‘Chameleon’, all with their own individual styles and personalities. 2009 saw them tackle the release of their fifth long player, ‘Travel The Galaxy’ a project which once again proved them as true masters of their trade and many claimed was their best work since Wormhole. The duo have now finished their latest album ‘No Cure’, a project which brings an eagerly awaited injection of that classic Virus future funk with a blend of today’s production techniques and is again very hard to resist. We are delighted to be part of the worldwide tour presenting these new, defining sounds to the public! Next to their own work, Virus now also has an artist list representing the best producers ever to grace the bass music scene. Two of those will be joining them for this Star Warz showcase: Optiv & BTK. When it comes to lethal, outstandingly produced, tear the club out and leave it in shreds style Drum ‘n’ Bass, Optiv & BTK have been one of the first names on tastemakers, ravers, DJ’s and promoters lips for a few years now. From Optiv’s early days as part of the highly influential Cause4Concern camp, production values and musical integrity were always at the forefront of his work. BTK notes the identical values when producing and signing artists for his own notorious ‘Dutty Audio’ label. It is this joint bond of strong ethics together with a similar hunger, appetite and passion for well produced and hard hitting Drum ‘n’ Bass music that has seen the relationship between these two artists mould perfectly. Since their initial link up in 2011 in BTK’s current home of Switzerland the duo have taken the scene by storm with a huge catalogue of well received tracks, releases & remixes on labels such as Subtitles, Blackout, Renegade Hardware, Ram, Commercial Suicide, Frequency, Dispatch, Playaz, Shogun Audio and of course Virus where they released the breathtaking album ‘Blackjack’ which was subsequently nominated ‘Album of the year’ at the 2014 Drum & Bass Arena awards. Both Ed Rush & Optical as well as Optiv & BTK will be given 2 hour sets so they can create the perfect Virus vibe on this Virus Recordings label night. They will be joined by Belgians who can easily live up to the Virus standard, starting with New Deal. Two DJ’s & two MC’s performing back2back, bringing fresh Drum ’n’ Bass, that’s New Deal! One87 and Hookerz combine solid mixes and a well balanced selection that covers both new and classic music making their sets anything but a routine and sure to leave you moved. Making the deal even more attractive, the microphone will be carefully handled by MC Nice and MC Mush. Engaged to give it all they got and provide you with the freshest dubs, the best mixes and the freakiest flows, all you need to do is dance! That is the deal! And finally there’s Tito who started listening to Drum ‘n’ Bass around the time when Virus Recordings was born. Since that day he has been infected with the Drum ‘n’ Bass virus. He became a well in demand dj. who’s style ranges from deep rollers to dark and raw, wobble and jump up, bringing lots of variation in his sets. You can also find him mixing back to back with Echo Virus on regular occasions. It is with Echo Virus that he started to organize events and in 2004 Stealth Bombers was born. Stealth Bombers quickly developed into the most successful and longest running independent Drum ‘n’ Bass event in Antwerp and grows bigger with every edition. Prepare yourself for heavy drums and furious basslines! Prepare yourself for Star Warz!